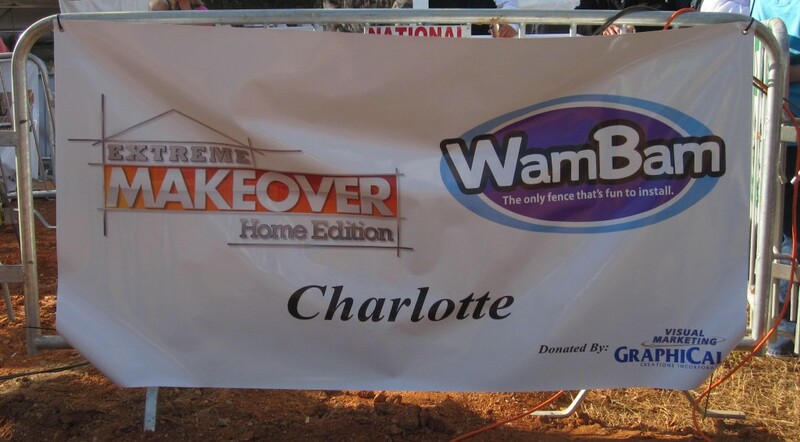 This past December, we had an amazing opportunity to be a part of the popular TV Show “Extreme Makeover Home Edition”. That’s how I wish I could start the story of how WamBam Fence got to be involved with this high profile TV show, but alas, the truth is not quite so glamorous. Still, like most opportunities, it was the collision of events that were meant to be. 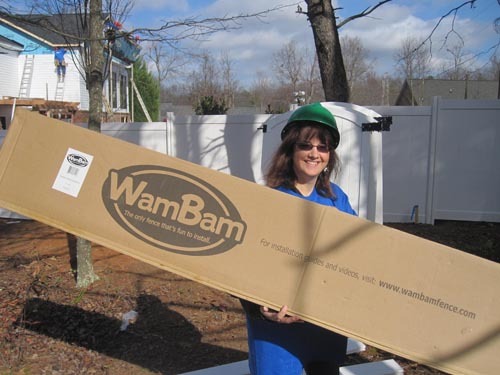 My name is Denise, and I’m one of the founders and owners of WamBam Fence. If that sounds cool, the next sentence is not: I’m also member of Toastmasters International. If you’re not sure what that is, just Google it, and you’ll realize that it’s kind of geeky. Knowing that there were many ears tuned in, I gave the right answer: “Sure, I can get you a fence.” I was thinking they needed maybe 10, 20 panels tops, and that it would be pretty cool to be a part of the project. “How many feet?” I asked. “Close to 400,” He replied. I almost spewed my drink all over the place. “Um, wow. That’s a lot. Ok, well, I’ll have to check inventory.” It was a weak back paddle; I knew we had the inventory. It’s just that that was a lot of fence! I wanted to be a part of this project, but it was no small commitment for a relatively newer start-up like us. People assume that with a show like this, your logo and company name get splashed all over the place, bringing in major revenue. That’s not the case at all. Unless you’re willing to pay the big bucks—and I mean BIG BUCKS that would blow our marketing budget for years to come—the show will never display a logo or mention your company name. There is absolutely no coverage of your company, brand, or product. Those petty doubts quickly went away. It was a great opportunity to be a part of something bigger than ourselves, and even though it was a heck of a lot of product, it was really cool to be able to give back to the community and be involved with this. It’s funny how things work out, too- because although we were all in to donate 100% of the product, when our manufacturing partner found out about the opportunity, they immediately offered to give us half the product for free in exchange for a press release. We were a bit nervous about the install. Since we are manufacturers, we don’t offer installation services. I need a few more years at the gym pumping iron before I can wam bam pipe into the ground like nobody’s business. Wade found a crew of 15 or so volunteers to install the fence, which had to be completed in 15 hours. While we were sure that they would be competent—after all, our product is designed to be easy to install– having a crew of people unfamiliar with the product on such a tight timeline caused us a bit of anxiety. We really wanted it to go smoothly, quickly, and yet look good. A good install is critical to the final fence looking good. On the day designated for the fence install, Stephen, Linda, and I went on site to pitch in. 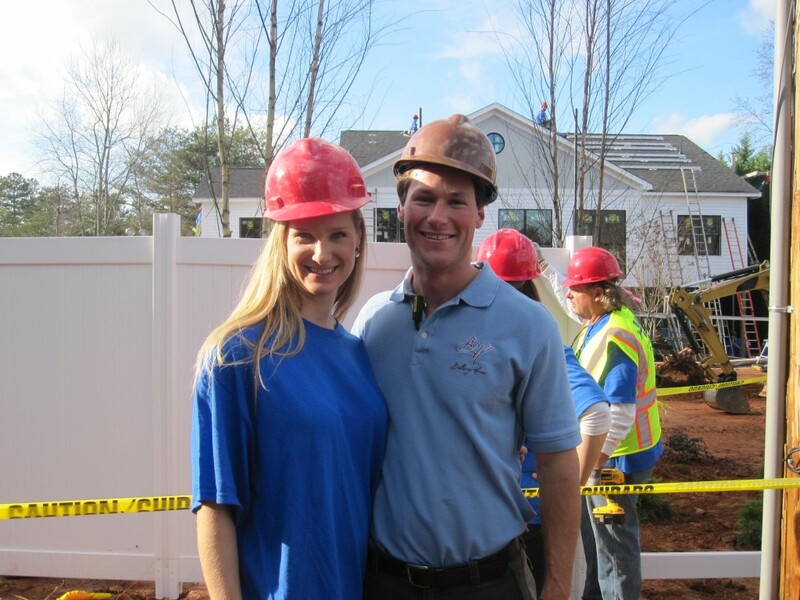 There was security and check in areas where we received our mandatory hard hats and t-shirts. Once we got to the site, it was really cool. The energy at the build was amazing. 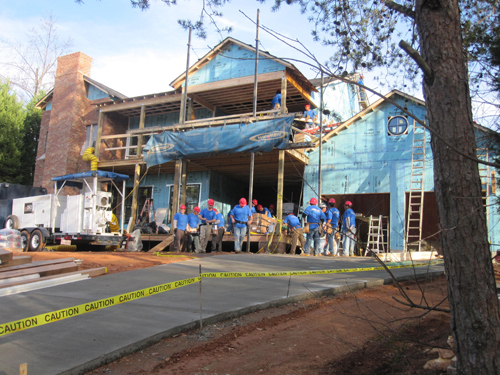 It was shocking to see a half-built home that was supposed to be completed in only 2 more days. The amount of people and organized chaos on site was invigorating. 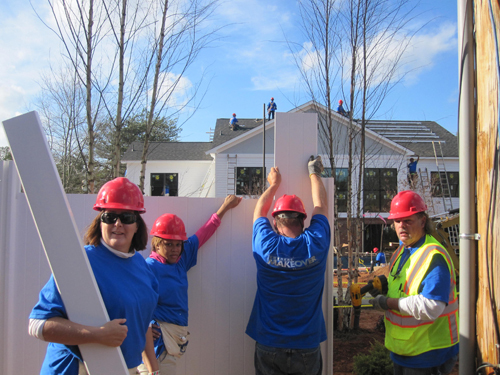 Stephen, Linda and I pitched in a little, but the real heroes were the volunteers from Archer Western Contractors, particularly John Stull who lead the team. They worked tirelessly for hours to get the fence installed. Of course our anxiety was completely unnecessary- they did a great job and the fence looked fabulous. As if the opportunity wasn’t cool enough, when I learned a bit about the family receiving the home, it struck a chord within. The Fridays have fostered more than 30 children, and last spring they fostered a boy who showed them a video of his 4 siblings, all split up by the system. Declaring that a family should never be split up, the Fridays adopted all 5 children. Because their home was too small, the Fridays were forced to convert their carport into bedrooms to make space for the children. Ironically enough, this story hit kind of close to home for me, because many years ago, my grandparents did a similar thing: despite having 7 kids of their own, they took 3 orphaned children into their home so the siblings wouldn’t have to split up, and raised them as their own. Knowing that my father grew up in a home with a similar situation– and seeing how much difference my grandparent’s act of kindness made in the lives of my adopted Uncles and Aunts– I was able to appreciate the Friday’s sacrifice that much more. Once the dust settled, Wade met with the family to go over how to operate their new home. He buzzed me an email: “I have to admit that what they raved most about was their fence. They were so happy to have a fence it was crazy. I think it’s because there are so many new children coming through their home that they want to keep them off the neighbor’s property.” This email made my day. The show isn’t scheduled to air until 2012 for a Christmas special, and we’re excited to see the finished episode. We don’t expect to see much fence on the show, because the home’s fence is just a subtle backdrop to define the borders of their property, as any good fence should be. What really matters is being a part of something bigger than ourselves and being able to give back just a little morsel to the community. Normally we like to hire professionals to do our videos and photography, but since the Extreme Makeover project was last minute, our go-to guys weren’t available. What you see is my ad hoc photography, videoing and attempt to slap it all together. It’s pretty grass roots, but I hope it can at least capture the essence of the experience. All the pictures are on the WamBam Facebook page. Click here to see the whole album. We’re excited to launch a new line of product: WamBam Traditional. 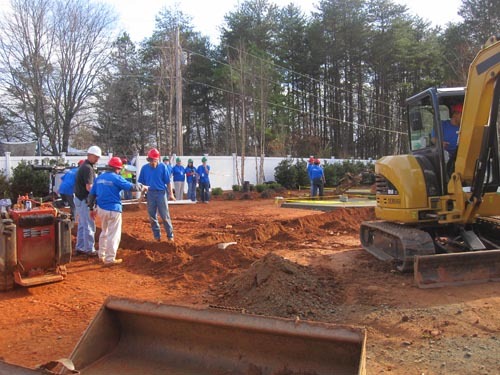 This new line is installed the traditional way- by digging holes and pouring concrete. 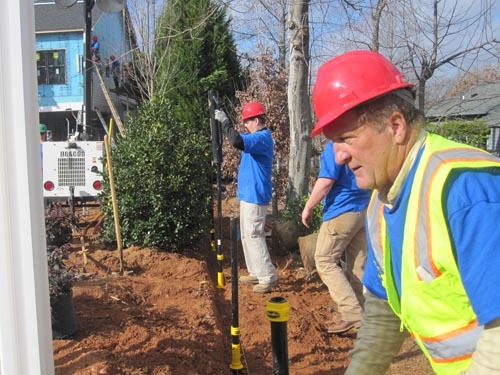 For a company that’s so big on digless fence, you may be wondering why we’re offering a traditionally installed line that is not “Fence that’s fun to install” as our digless fence tagline so proudly declares. Like the beginning of everything, it starts with a story. We’re proud of our relationship with Tier 1 retailers such as BJs.com, HomeDepot.com, Menards.com and Costco.com. These are great companies that we are honored to partner with to sell our product. When we launched our original WamBam digless fence line, we charged ahead with these name brand accounts, and flooded them with 54 different items. The more the merrier, right? Unlike selling widgets online, our digless vinyl and aluminum fence systems require some education for the end consumer to understand. It also requires a great deal of components to do a complete project- from posts to panels to gates to caps to anchor kits. Trying to force a project-based product into their systems resulted in problems. It was difficult to properly educate their customers on digless fence. Customers weren’t sure why they needed digless anchor kits, or worse, weren’t aware that posts needed to be ordered separately and simply didn’t order them. 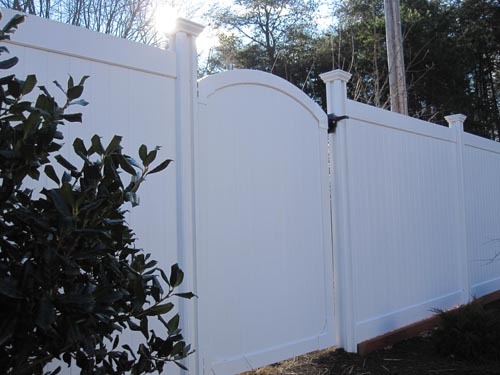 The project-based product–combined with the unique digless installation method–resulted in an abnormal amount of uneducated and frustrated customers who weren’t able to simply order a digless fence correctly online. So we needed to simplify. That was the goal. Our current program was a little like fitting a round peg in a square hole in their dot com platforms, and as a result, it was clunky and cumbersome for the average user browsing www.homedepot.com for vinyl fencing to simply order our fence (and any fence, for that matter!) online. So we axed all the items, and re-birthed just a couple of our best sellers with some major changes. The panels come in a one-box unit that also include a post and a post cap. The install method is traditional so customers don’t have to wonder what the heck an anchor is and why they need to order it. These changes made it simple for our resellers to merchandise online, which in turn will make it easier for the end customer to order and understand. Don’t get us wrong- we are still just as passionate as ever about WamBam digless fence. It’s a game changer, and people love it. Soon you’ll see an upgrade on our site making it easier to purchase all the components required for your digless fence. Plus, we love the fact that we can talk to our customers and ask them questions. Qualifying customers helps us ensure that we are a good fit and that they will have a great experience. However, in the world of major dot com retailers, we feel that the new WamBam Traditional line is much better suited for them because of its simplicity. The new line is now available on www.homedepot.com and www.bjs.com and soon will be on other name brand websites you know and trust. Below are product video demos for the new line which will be found on these sites. You can throw some virtual tomatoes at Denise!